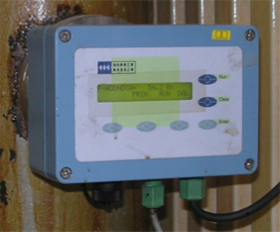 The HK6 -F is an in-line microwave measurement instrument to measure the BRIX content in the running sugar production. BRIX is the percentage by weight of sugar in pure water solution. 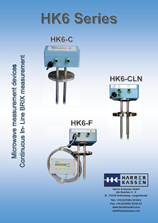 The microwave measurement devices generate an electromagnetic wave of low energy. This signal is coupled via an antenna into the product. 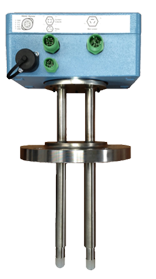 Is the measuring point good accessible the HK6-C (Compact) with integrated pin antennas and DN65 flange is the best choice. The operation is made by the integrated membrane keypad. 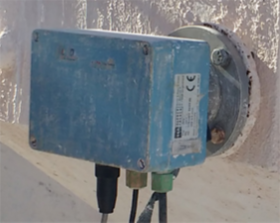 The HK6-F is using our pin antennas, where an optional cleaning could be included We advise you gladly which antennas for which application or measuring kind the best results supply. The HK6- CLN is the only compact solution on the market for the continuous measurement of the BRIX content at a continuous cooking pan. If an instrument whiteout cleaning function is installed at a continuous cooking pan, the antennas are covered with crystalline sugar in a short time. 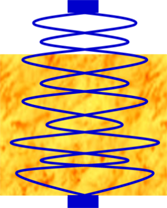 Through the covered antennas, the measurement result is distorted because covered sugar between the antennas is measured. A correct measurement of the BRIX content is therefore impossible. A HK6- CLN is equipped with an automatically cleaning function, the antennas are cleaned over the whole production in a periodically interval. The cleaning function ensures a reliable measurement of the BRIX content. Optional the HK6 can be equipped with a RS-485 interface. With this interface and our HK6 Display software you are able to connect up to 16 devices in a bus and the measured values are displayed in one window.